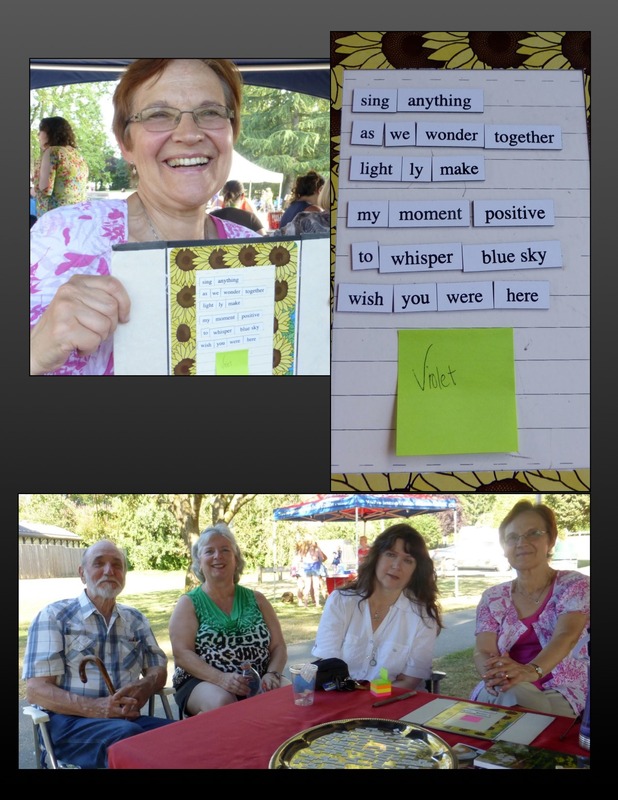 Fraser Valley poets gathered to ring in summer with poetry on the night of the summer solstice. 3. Good vocabulary with connotative words. 10. Rhythm and rhyme (especially if it’s a more traditional poem). Thank you, Alvin, for an informative and useful presentation! 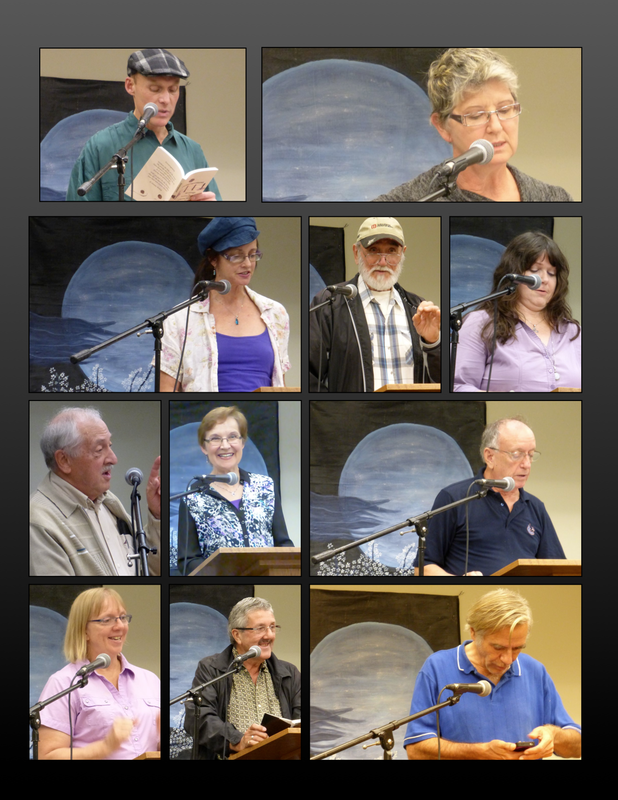 During the open mic portion of the evening we enjoyed an interesting variety of poems from fifteen readers. Though they’re not all pictured here in multiples, the variety of poses I captured during the reading got me thinking about how a poetry reading is not only about the words of the poem read but also about tone of voice and body language. It’s a multi-sensory performance—and experience for the audience! a grin or a frown. 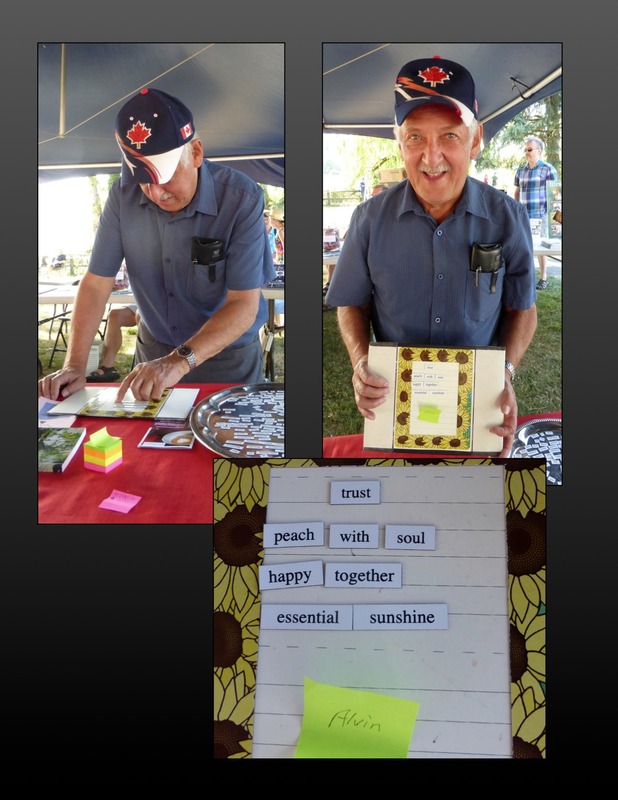 FVPS will be taking a break from organized poetry nights during the summer. 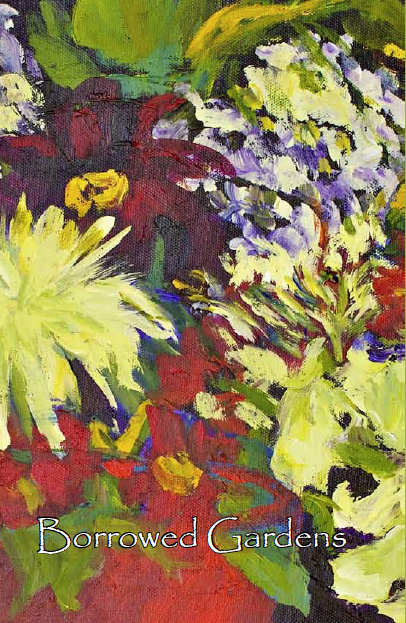 Sign up for our email newsletter to stay informed about summer activities of interest to poets in the Fraser Valley and Greater Vancouver area. 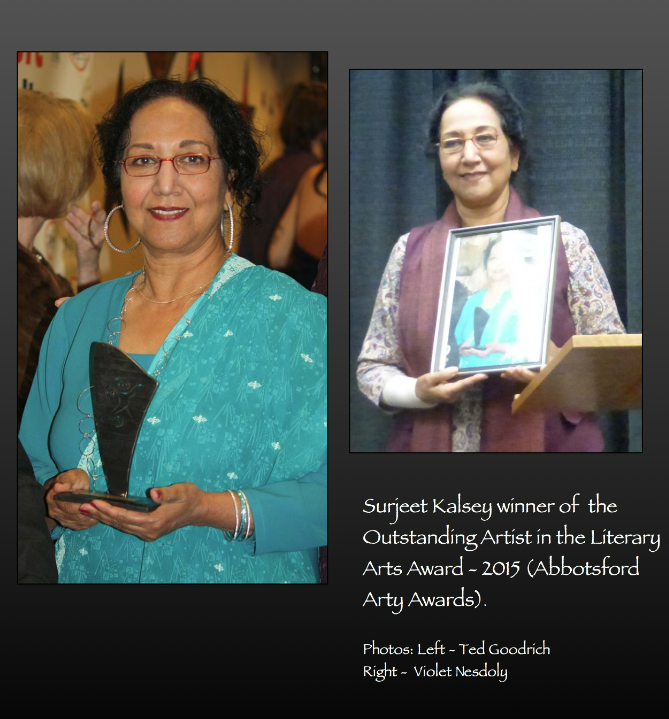 But we’ll be back on Monday, September 12th, 6:30 at the Clearbrook Library (32320 George Ferguson Way, Abbotsford) for more poetry and to celebrate International Literacy. Welcome to April – National Poetry Month (and that’s no April fool)! 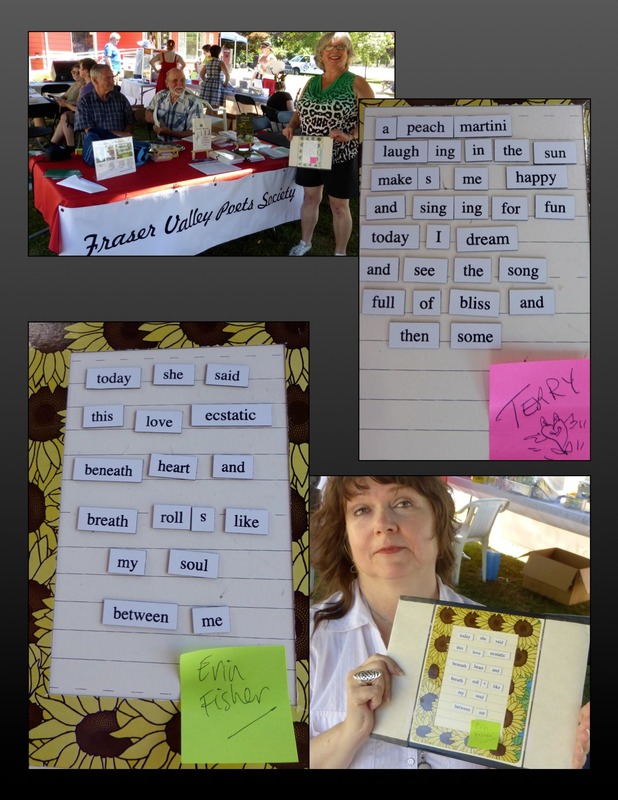 How will you celebrate poetry this month? One idea is to attend a poetry reading. 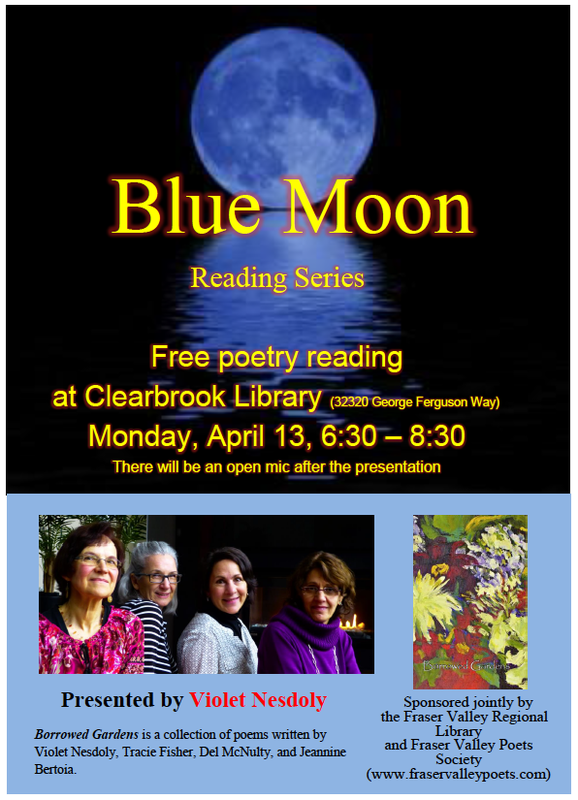 Fraser Valley Poets Society’s April event is a Blue Moon Reading on Monday, April 13th. 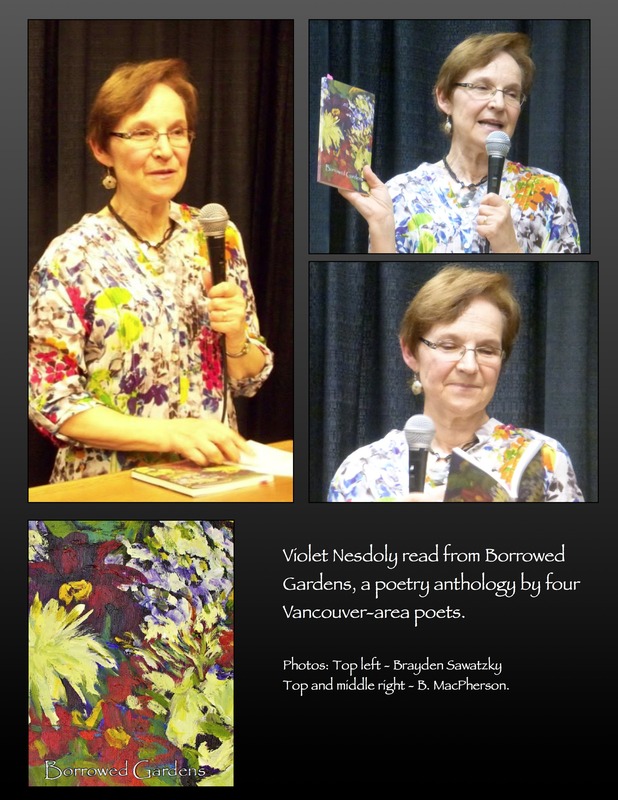 The featured reader that night is Violet Nesdoly, reading from Borrowed Gardens, an anthology of personal poetry by four Vancouver area writers: Jeannine Bertoia, Del McNulty, Tracie Fisher and Nesdoly. 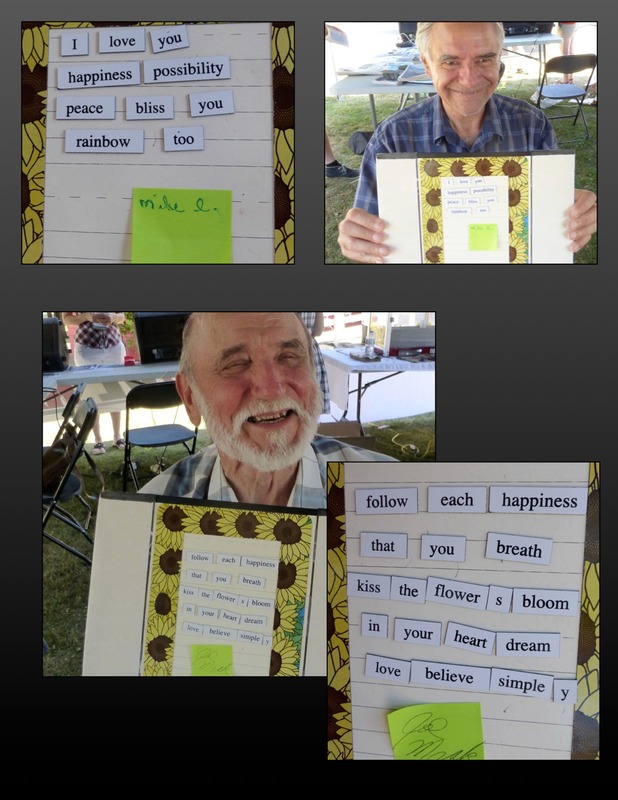 Bertoia and Fisher have both had haiku honoured in Vancouver Cherry Blossom Festival. A poem by McNulty won the top poetry prize of the 2010 Surrey International Writers Conference contest. Come and meet these fine poets through their writing. There will be an open mic after the Blue Moon Feature. 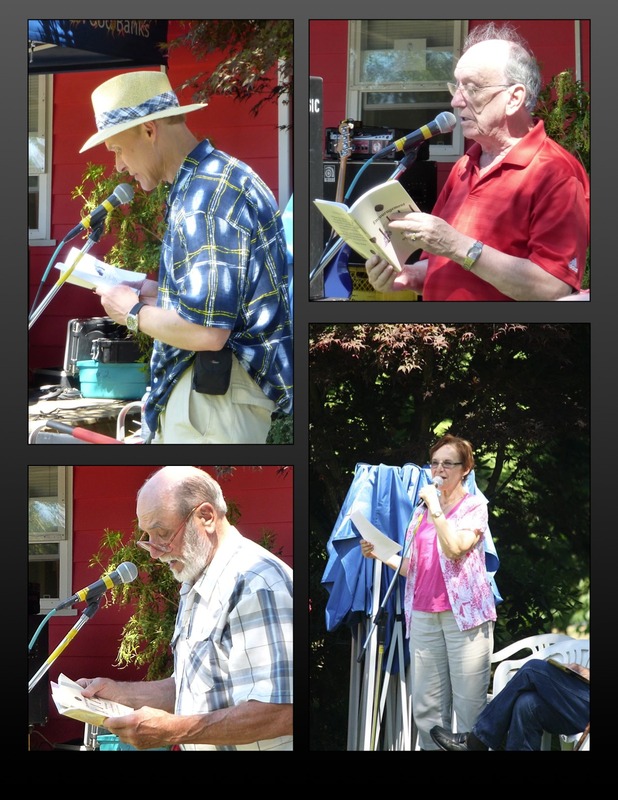 A group of seven poets met in a cozy circle Monday, June 2nd, for our June Open Mic. 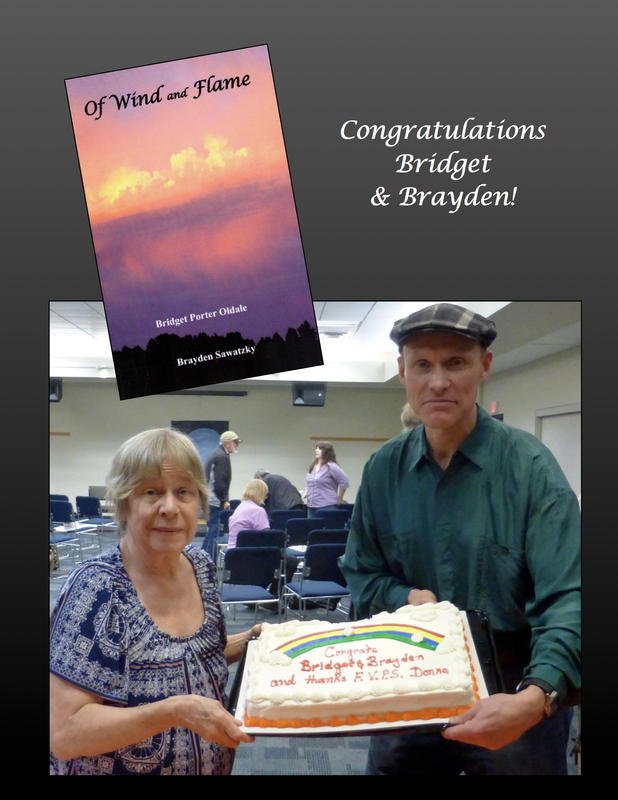 As usual, the poems were varied in subject (nature, relationships, people, the meaning of life—you name it…) and author with several readers sharing favourite poems of others along with writings of their own. What better way to spend a Monday night than sipping on a coffee or juice, eating homemade cookies, and reading poetry? 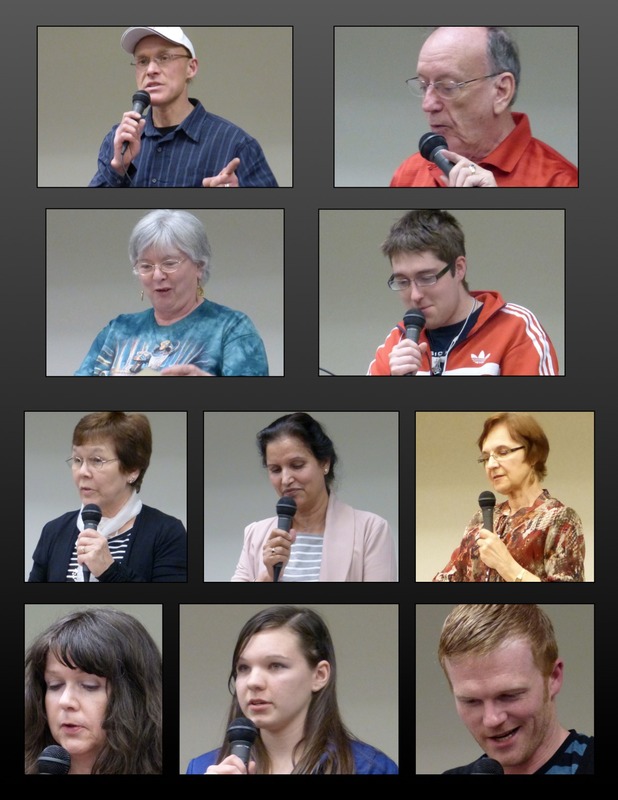 Six of the seven June 2nd open mic readers. 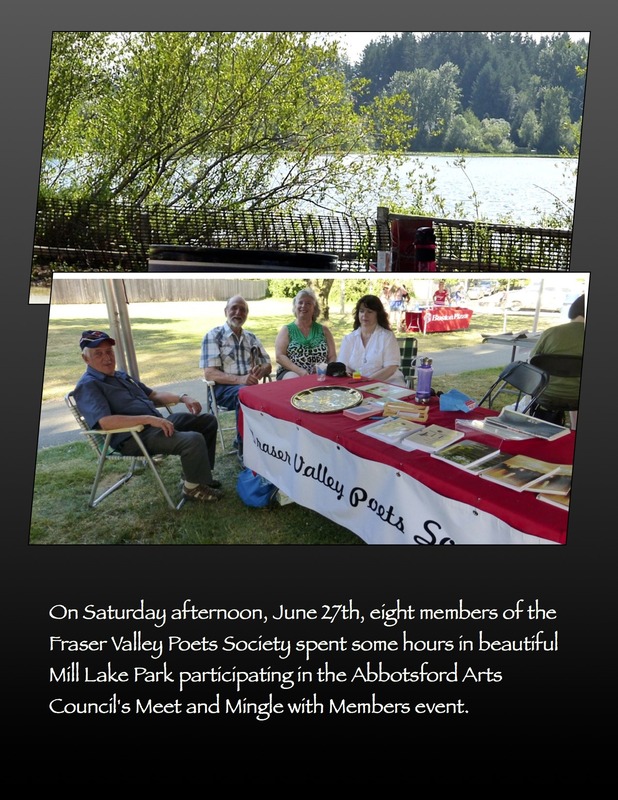 Fraser Valley Poets Society will now be taking the summer off. Our next event is September 8th, when we hope to launch a very special anthology honouring our founder, Donna Bishop. 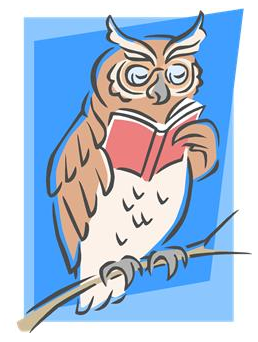 (On September 8th we will forgo the open mic portion of the evening and focus our attention on the launched book). 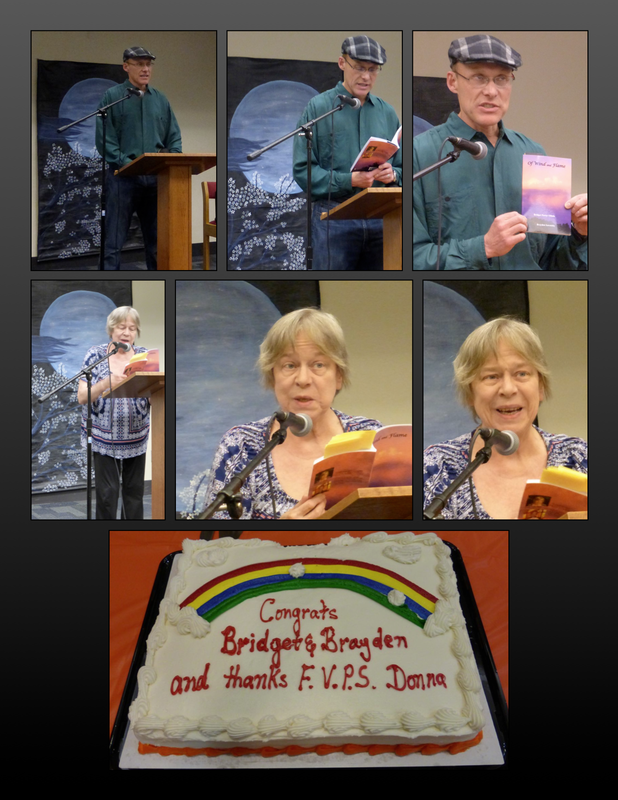 An open mic segment began the Fraser Valley Poets Society’s April 7th Blue Moon reading—our second reading of 2014. 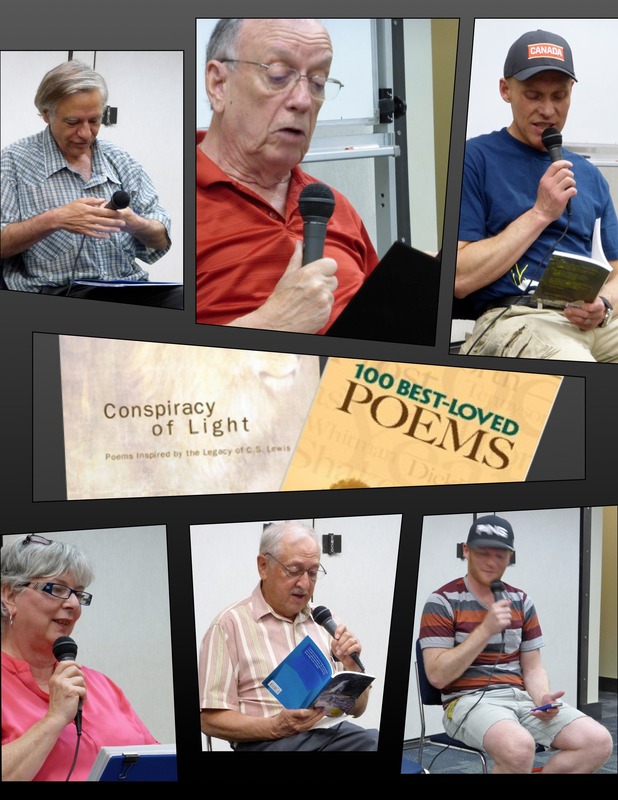 Ten readers performed works on subjects ranging from Malaysian flight 370 to brushing teeth in the shower. 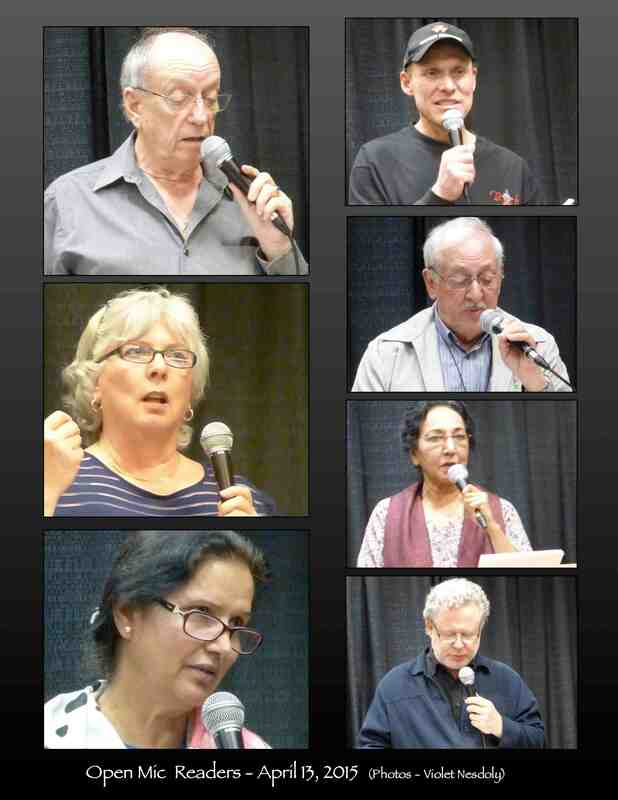 Several poets remembered Earth Day and one sang her thoughts in Punjabi. 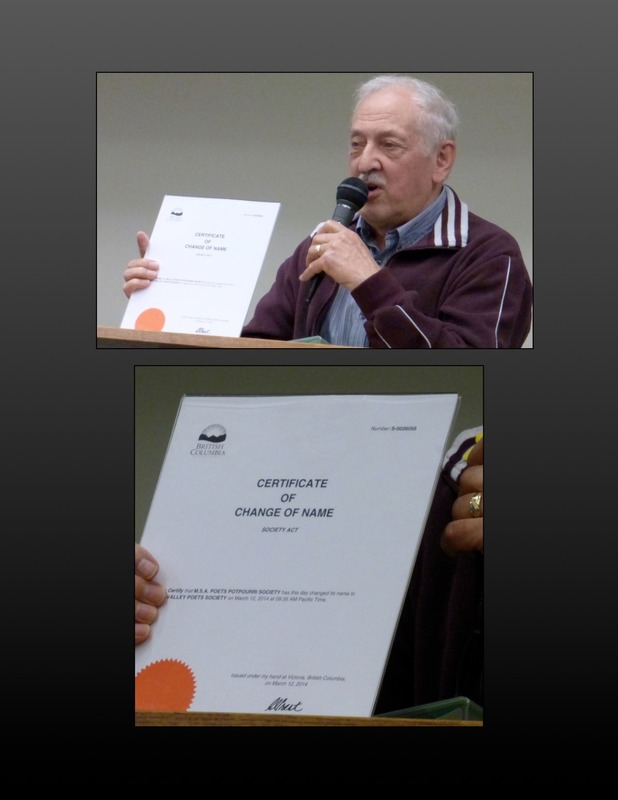 Alvin Ens proved to us that it’s official—our name change from Poets Potpourri Society to Fraser Valley Poets Society. He also announced a book giveaway for our next meeting (see below). 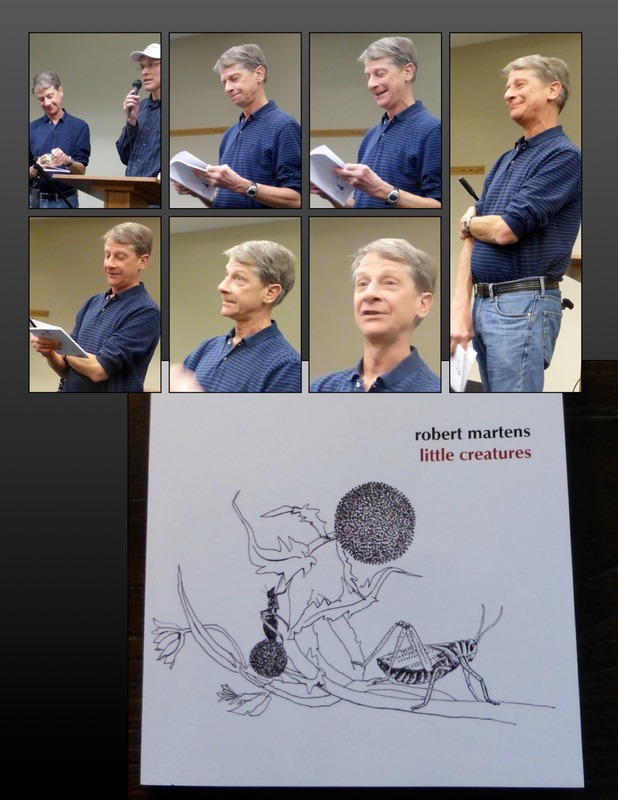 Featured reader Robert Martens read from his newest book little creatures (Ekstasis Editions, 2013). The first section of the book, little creatures, has poems with titles like “cocoon to butterfly,” “the plague of the flea,” and “mother mosquito” leading listeners and readers to believe these will be about insects. “They are about these little creatures,” Martens assured us. “But they’re also about more.” In addition to other poems he read “cricket moods” that speaks in picturesque language about cricket choruses throughout the day but also illustrates the sinister power of voices raised collectively. As usual, Martens’ reading was entertaining but too short! Sales of his book were brisk, and I now have a copy of my own. Since Monday night, I’ve spent not a little time chuckling over and pondering the poems in this thought-provoking, sometimes prickly, and often humorous collection. (The cover and title page drawings by Heinz Klassen add to the whimsy). Purchase a copy from Ekstasis Editions. Our next meeting is Monday, May 5th. It will begin at 6:00 p.m. (note the change from the usual 6:30) to accommodate the membership taking some time to ratify our amended constitution. We hope to have lots of time, as well, for an open mic. May 5 – 6:00 – 8:30 p.m.